Like many of you, when I hear about a new product from a brand I love, I want it immediately. This could not have been more true than when I found out that NIOD were releasing a face mask. I love NIOD and I love masks, so this purchase was a no brainer. I was lucky enough to get my hands on it pretty quickly via the amazing Victoria Health and since so many of you have been asking me about it already (we skincare addicts are pretty impatient it seems), I have decided to do a ‘First Impressions” post to give you all the essential information and my initial thoughts. So, in true NIOD fashion, this new addition is all about improving upon an age old beauty practice (clay masks) and creating something even more effective, less skin irritating and without an excessive price tag. Flavanone Mud works to deeply cleanse the skin, remove surface impurities and also protect the dermis from pollution that can lead to premature skin aging. Purifying Phase: breaks down water and oil soluble impurities, black Amazonian clay refines pores, white clay removes excess sebum and a Brazilian copper rich clay reinforces the surface barrier to protect from any irritation. Protective Phase: provides a defense against external environmental build up by including ingredients like Polynesian sea polysaccharides to fight pollution, “an advanced analogue of resveratrol to protect against environmental browning”, protection against pro-inflammatory factors through the bitter orange peel derivative and an “ultra-pure” bisabolol (from German Camomile) to fight inflammation. Responsive Phase: focuses on the health and longevity of the skin through the inclusion of “a highly-purified flavanone” (from the inner white parts of citrus peel) to induce a non-inflammatory decongestion process and modified oleic acid to defend against inflammation. This stage is considered the most important which is why the mask is named after the star ingredient used in it. This mask has so much going on and all these elements come together to decongest from the inside out and also protect the skin from future congestion. It’s an interesting approach because it attempts to go beyond the standard (and temporary) “purge and purify” we get from typical clay masks by creating long term purity and radiance. I used the mask for the first time a few days ago and I really liked it. It has a deep terracotta color and the texture is like smooth chocolate frosting. It spread incredibly easily due to the “dispersement mechanism”, which means you use less and most importantly, waste less. There was a mild scent of spice mixed with cacao (definitely noticing a chocolate theme with the color, scent and consistency), which wasn’t at all unpleasant and did not linger. When I applied it to my face I did feel a slight tingling sensation but certainly no stinging (even when I removed it) and I have somewhat sensitive skin. It didn’t feel tight or uncomfortable as it dried and it rinsed away easily and quickly. I left it on for about 1/2 hour as NIOD recommend just 10 minutes but I read that Gill from Victoria Health had left it on for a few hours so I figured 30 minutes was a good in-between amount of time. Once I had removed the mask there was no irritation or redness. My skin was lovely and soft, incredibly smooth and not at all taut or dry. With that being said, I didn’t notice anything above and beyond the results I get from my other favourite clay masks but I believe as with products such as CAIS, it’s in the long term effects where this mask will really distinguish itself. Overall, I think Flavanone Mud has great potential and I highly recommend checking it out, as it’s a very well made product at an excellent price. From tomorrow I am going to try the “accelerated” approach and use it for five consecutive days and see what happens because from what I’ve read, I believe the most important results are going to be seen in the continual skin health benefits as well as the sustained anti-inflammatory and purification elements. This is now the cheapest mask I own but as to be expected from NIOD, is the most innovative one I have and I’m excited to see if it lives up to the claims and my high expectations. 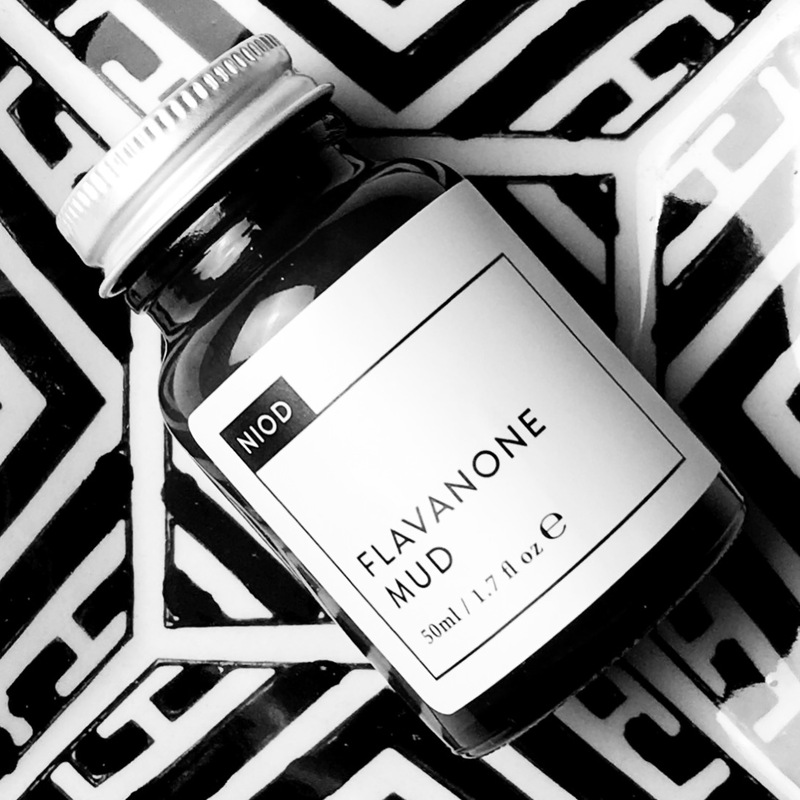 NIOD Flavanone Mud 50ml is £28 and currently only available from Victoria Health here. < Previous February (new) Favourites and Announcement! Next > Best of British: La Belle Lune Organic Skin Review and Giveaway! I am more intrigued by their cleansing ester. Have you hear about it ? Sounds interesting! I’ve bought the NIOD CAIS but haven’t started it yet, the brand, and all the brands under Deciem are really innovative and I’m liking trying a lot of thier products. I love face masks and I love coming across new ones I will definitely be trying this & I cannot wait! I had high hopes for this product but it just didn’t deliver ANY results for me at all. I used the product on 5 consecutive days for the full 10 minutes each time and I can see no difference in my skin AT ALL. No change, no improvement, no glow and no results at all. I waited for the much anticipated stinging sensation and never got that either. It just did nothing WHATSOEVER for my skin. I had a spot on my skin before I started using the mask and I’d hoped that the mud would have sorted this out but the spot was still there after the 5 days as large as life. The mask had no effect on my skin whatsoever. I never felt that it cleaned my skin out or make it smoother or made it glow. I’ve had better results from a cheap face mask. I so wanted to feel the stinging sensation knowing the mast was doing SOMETHING but I never got that either. It’s expensive for what it is so once I finish this pot I definitely WON’T be repurchasing again. An expensive mistake on my part and one I’ll chalk down to experience.